A dining experience without the thumping music, waiters dressed sophisticatedly and every process orderly. But most importantly, you don’t have to wait for a table! They take reservations for a great night out in the heart of Melbourne – Flinders Lane. They have three levels, starting with semi-private nook on dining tables, then sushi counter & restaurant on ground floor and upstairs where the Chefs Table – Kuro Kisumé, for a quiet and intimate setting. They call it “kaiseki-style dining”. 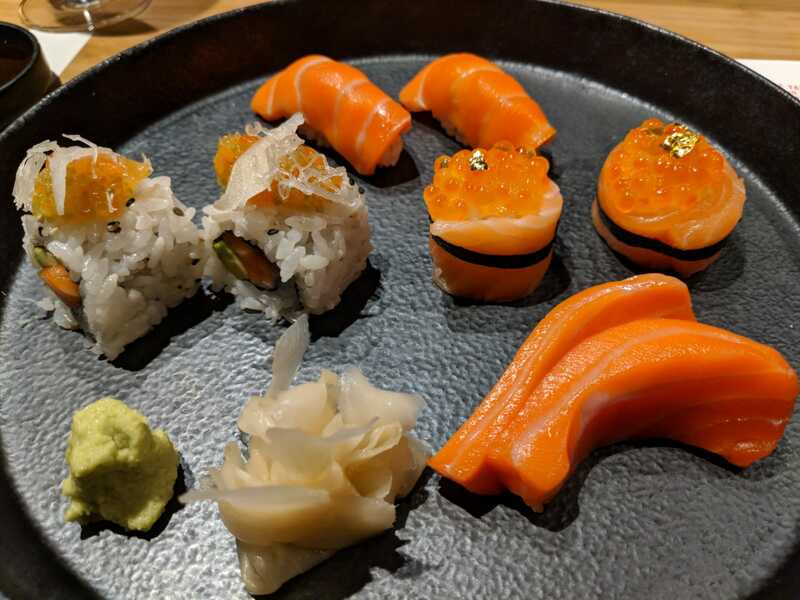 Our experience was mainly from the cold foods – we had the Omakase – $88 per person: seasonal appetiser, 11 nigiri (chef’s selection of sushi) finished off with miso soup. Not long after… Yong, our chef for Omakase introduced himself and asked about our dietary requirements. Handed our seasonal appetiser which was mushroom puree with seasonal mushroom and enoki, sprinkled with bonito powder. It was a sweet cold dish with mild flavours and we both felt it was a refreshing start! Our first nigiri was the Blue fin tuna from Port Lincoln, then the second was the same fish but toro (belly). The fish melts in your mouth, with the second one stronger than the first. At each nigiri, I’d have one slice of ginger to cleanse the fishy taste before trying the next beautiful fish. Next came Sword fish from New Zealand, the garnish is toasted nori. The sword fish was more solid and the garnish brought out the sweetness and the fish flavours. 4th was the Port Lincoln’s Kingfish, garnished with soy marinated miso and spring onion. Again, I liked the garnish. Kingfish is usually fresh without a strong taste, the miso added flavour to the nigiri without the need to dip soy sauce on it. 5th was salmon – our favourite. From New Zealand they added vinegar apple garnished with white onion. It was salty having it lightly seared with a sweet aftertaste. The best nigiri of the night. Seared dog fish was next. Searing it makes it so smokey and the sea urchin gives it a creamy texture but not overpowering the fish. Seared Calamari from Port Phillip Bay with calamari jelly. I enjoyed the jelly, the calamari was savoury from searing it, then the jelly brought out the sweetness. It was my second favourite! Third last was seared scallops with foie gras in seaweed. A combination of smokey, crispy from the seaweed and strong flavours from the foie gras. Second last was the baby sardines cured with rice vinegar garnished with ginger and miso. The fish was too strong for me it was our least favourite dish. Sorry – I forgot to take a photo of the baby sardines nigiri! Our last nigiri was scampi from South Australia with scampi caviar, salmon roe, and finger lime. This one was good to bring back to the mildness of the flavours. Wait there’s more! We weren’t full after 11 nigiri and three sides so we ordered more~ Having loved the seared salmon nigiri with apple and white onion garnish, there’s no doubt Kisume’s salmon feature would be a good pick. The best of this platter is the Salmon Roe – full of flavour including the banded seaweed. King Salmon Roll was second best, there were bits of crisps which added a delightful surprise. Lastly, we ordered Matcha Pavlova as our dessert – black currant sorbet with whipped sheep’s yoghurt. We loved it, a dessert that is somewhat diary-free, ticked all our boxes. Sheep’s yoghurt had sourness combined with sprinkled bitterness from the matcha powder. Then surprised by the tanginess of the iced berries from the sorbet hidden inside. The matcha pavlova held the dessert together and had the right amount of matcha – enough to taste the matcha. You don't have to own a blog to follow me. Please leave your email behind to follow my food ventures by email whenever there are new stories.